To mark the official renaming of the 'Yesu Persaud Centre for Caribbean Studies', Guyanese philanthropist and businessman, Mr Yesu Persaud, visited the University on Wednesday 9 June. During his visit, he attended a lunch, hosted by Professor Stuart Palmer, and attended by a number of staff and postgraduate students from the Centre, including the Centre's Director, Professor Trevor Burnard and Professor David Dabydeen, who proposed the renaming. 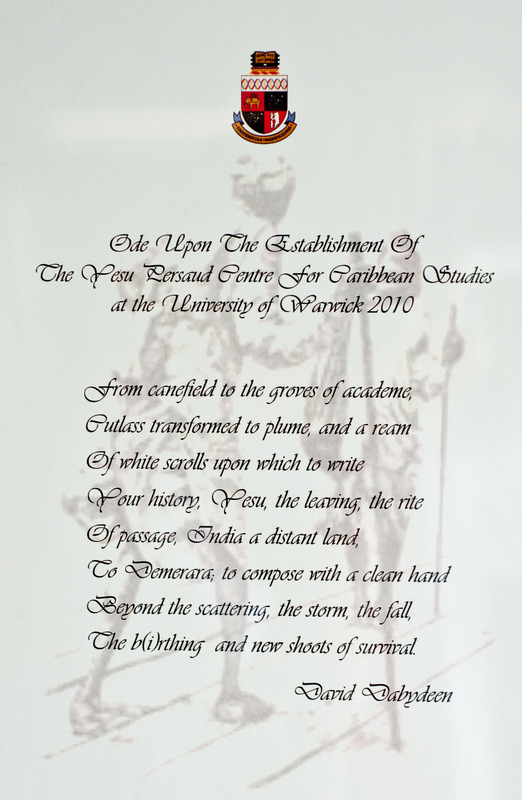 Mr Persaud also took afternoon tea with the Vice-Chancellor, Professor Nigel Thrift, where he was presented with a framed poem, written by Professor Dabydeen, to mark the formal renaming of the Yesu Persaud Centre for Caribbean Studies. Professor Stuart Palmer said: "Excellent centres, such as Caribbean Studies, are key to the success of Warwick’s international strategy - as is the counsel and philanthropic support of global citizens such as Yesu Persaud. Yesu has been a long standing friend to the University which we appreciate and hope is reciprocal. Today I hope we will forge new friendships which will grow along with the future success of the Yesu Persaud Centre for Caribbean Studies." Professor Nigel Thrift said: "The renaming is a wonderful way to mark the Centre's 25th anniversary. I am also delighted that Yesu Persaud has not only been an active Associate Fellow of the centre but, through his friends and business colleagues in the Caribbean, Europe and North America he has also brought in significant financial support for the Centre's work. We have long thought that all of this work should be more recognised. I am delighted that he agreed to allow us to rename the Centre in his honour. I know this will be warmly welcomed by Guyanese and Caribbean people." The year 2010 marks the 25th anniversary of the establishment of the Centre, one of Europe's leading institutions for Caribbean scholarship. The Centre researches all aspects of the Caribbean's history and culture. The Centre's Associate Fellows have included: Lord Alli, Professor Stuart Hall, Baroness Young, Trevor Phillips and Baroness Amos. Yesu Persaud has been an Associate Fellow of the Centre for some 12 years and received an honorary Doctorate from Warwick in 2008. Other senior Caribbean-related figures connected with the Centre to be honoured in this way include: Guyana's Sir Shridath Ramphal (a former Chancellor of the University), Nobel Laureate Derek Walcott, and Sir Hugh Springer (former Governor General of Barbados). Yesu Persaud talks about how helping people to help themselves is the most effective way of eradicating poverty (July 2008).